These Nordic recipes rooted in Scandinavia remind me of my own winters in Minnesota, where the author developed them. I’ve long had a warm place in my heart for Minnesota. It might have been my only warm part during the long cold winters I spent visiting my sister there and getting involved in Great Frozen North activities such as ice fishing, cross country skiing, sled dog racing, pond hockey, and trying to keep my car—a native Southerner like myself—in running condition. 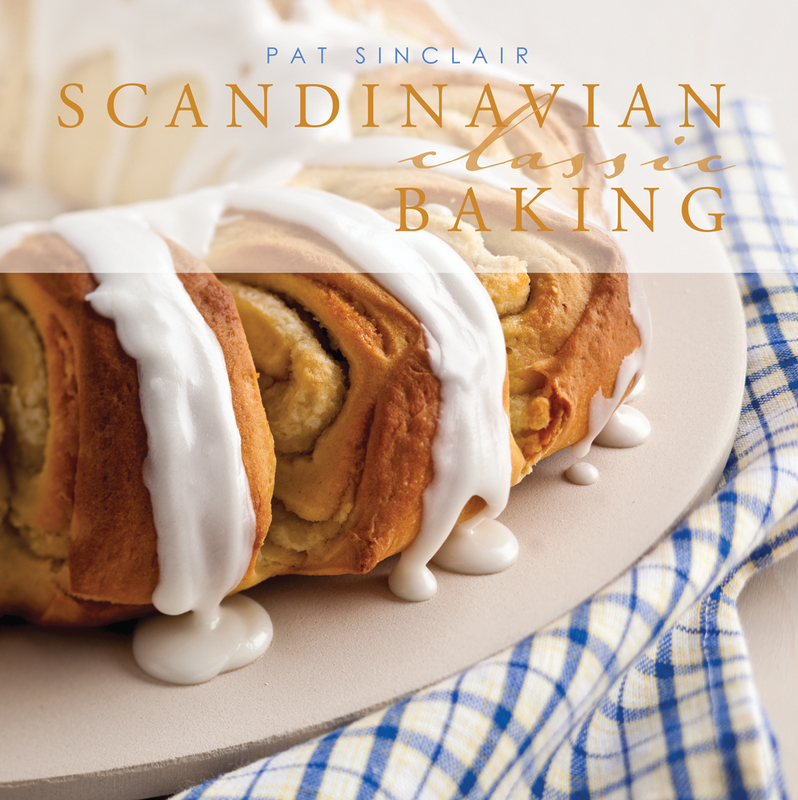 Those Nordic experiences are partly why I’m drawn to Pat Sinclair’s book, Scandinavian Classic Baking (from Pelican Publishing Company, $16.95). 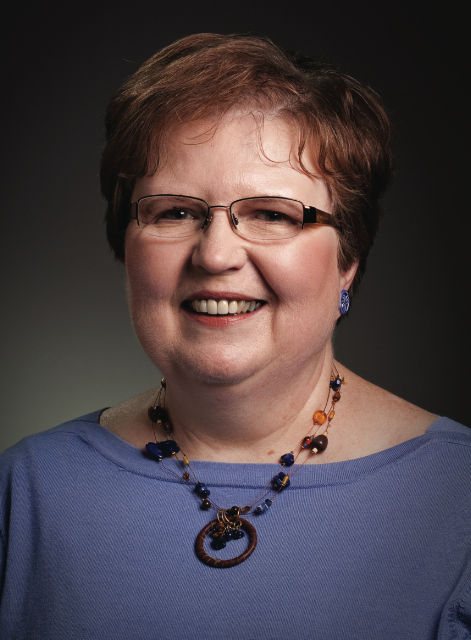 Based in Edina, Minnesota, this author, food consultant, and recipe developer’s baked goods remind me of coming indoors from arctic winter weather, being pleasantly surprised to find something delicious baking in the oven, and looking forward to that first still-steaming bite. 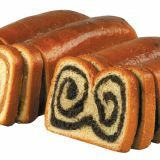 Given the Upper Midwest’s abundance of Scandinavian descendants—all of them more accustomed to extreme cold that I am—those goodies fresh from the oven usually reflected the cuisines of Sweden, Norway, Finland, and Denmark. The aromas of cardamom, cinnamon, nutmeg, and orange peels dominate baking days, often accented by the yeasty smell of rising breads, by colorful tarts loaded with berries, and by pastries bristling with nuts. Scandinavian Apricot Almond Bars. See the recipe in a separate post. Photo by Joel Butkowski. At first the names of some of the recipes threw me. But under Pat’s guidance I soon learned that aebleskiver means pancake balls, fattigman is poor man’s cake, and pepparkakor translates to spicy cookies. Also, lefse is a sort of sweetened and fried potato crepe served with butter and sugar, toscakake involves a top layer of sliced almonds covered with buttery caramel, and sandbakkels are butter cookies whose dough gets pressed into fluted tins before being baked and are later filled with whipped cream, jam, lemon curd, or chocolate ganache. Pat got my attention with 42 recipes ranging from coffee breads (especially the Danish Almond Tea Ring shown on the cover), cakes (the Norwegian Toscakake stands out), cookies (I tried the Scandinavian Apricot Almond Bars recipe first and it won’t be the last time I make them), tarts (from blueberry to rhubarb), and pastries (such as Swedish Kringle made from a paste similar to that used in making éclairs). An intriguing addition to the format is Pat’s sprinkling of sidebar-style vignettes that elaborate, like a travelogue, on Scandinavian culture, traditions, celebrations, foods, and popular destinations. One brief entry explains the importance of cardamom, a member of the ginger family, in Scandinavian baking and recommends splitting the pods and grinding the seeds with a mortar and pestle right before use in order to release fragrant oils for the most flavorful results. Another encapsulates 700 years of Viking shipbuilding and exploration starting in the 5th Century. Finnish Browned Butter Teaspoon Cookies. See the recipe in a separate post. Photo by Joel Butkowski. Still more of these side notes expound upon reindeer, the candle-filled Feast of St. Lucia, the joy of eating Shrove Tuesday Buns the day before the Lent starts, the Land of the Midnight Sun effect north of the Arctic Circle (lots of daylight in summer but long dark winters too), Norway’s fjords and 11th-century Stave Church construction, Denmark’s ornate Amalienborg Palace and famous Tivoli Gardens, Sweden’s ancient city streets and modern architecture, Finland’s saunas, and more. 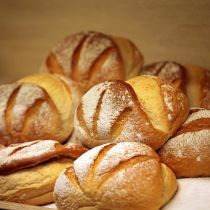 So besides offering goodies to bake and eat, Scandinavian Classic Baking provides quick lessons in foreign culture too. Once I tried baking a few of these recipes, the at-first strange terms quickly became familiar, joining the lexicon and the baking rotation at my house. Tonight, with spring coming on strong here in Alabama and with what most likely will be the last snowstorm of the season blowing across the northern tier states, I think I’ll bake Meringue with Peaches and Raspberries, the book’s most summery recipe. I remember bone-chilling Minnesota winters vividly, but a summer dessert like this seems just the thing to serve as a farewell to the cold and a harbinger of warmer days ahead. 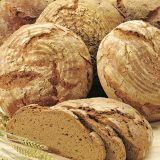 Find Scandinavian Classic Baking in bookstores or order it from Pelican Publishing Company of Gretna, LA; 504-368-1175 or www.pelicanpub.com. See author, food consultant, and recipe developer Pat Sinclair’s blog at PatCooksandBakes.blogspot.com. Click here to see a separate Bakery Boy Blog post with a recipe for Scandinavian Apricot Almond Bars from Pat Sinclair’s Scandinavian Classic Baking. Click here to see a separate Bakery Boy Blog post with a recipe for Finnish Browned Butter Teaspoon Cookies from Pat Sinclair’s Scandinavian Classic Baking. Click here to see a brief video of Pat Sinclair demonstrating her Finnish Brown Butter Teaspoon Cookies recipe during an appearance on Minneapolis-St. Paul television station KARE-11. Pat Sinclair’s Scandinavian Classic Baking (from Pelican Publishing Company) includes this excellent recipe for Finnish Browned Butter Teaspoon Cookies. 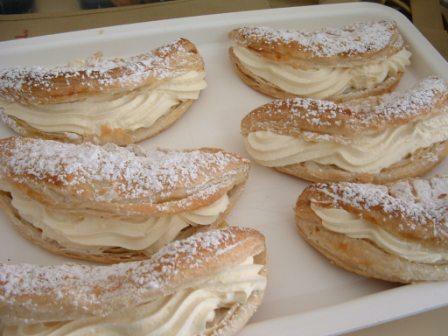 Click here to see a separate Bakery Boy Blog post with a review of the book. Finnish Browned Butter Teaspoon Cookies. Photo by Joel Butkowski. Brown the butter by melting in a medium saucepan over medium heat. Stir occasionally. When butter begins to foam up, stir constantly until it turns a deep golden brown. 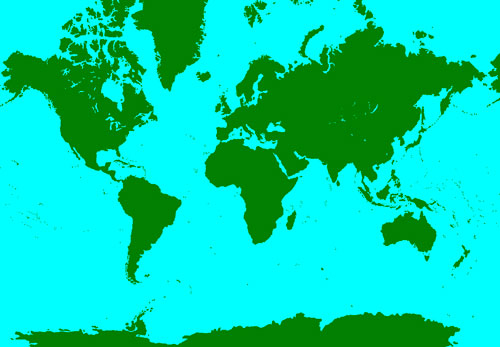 Watch carefully because at this point, the color changes quickly. It takes about 7 minutes to brown the butter. Cool to room temperature, about 1 hour. Mix the flour and baking soda together. Combine the cooled butter, sugar and vanilla in a medium bowl and stir until evenly mixed. Add the flour and mix to form dough. Shape the cookies by placing about 1 teaspoon of dough into the bowl of a teaspoon and pressing against the side of the bowl, leveling the top. Press out cookie, flat side down, onto an ungreased baking sheet. Bake 10 to 13 minutes or until lightly browned and set. Let cool on the baking sheet for 2 minutes and remove to a wire cooling rock. 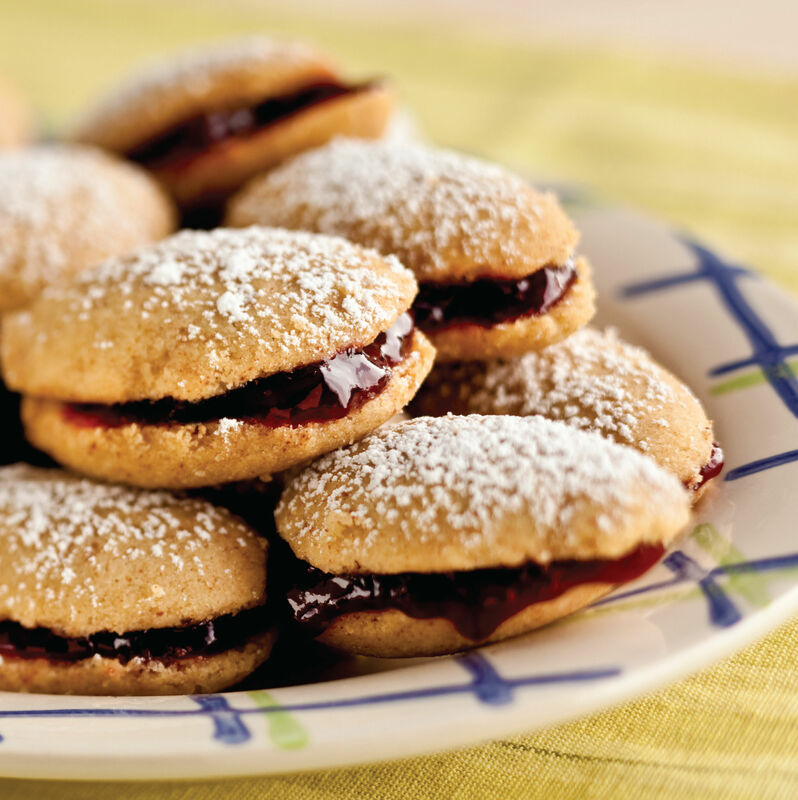 When cookies are cool, spread a scant ½ teaspoon of jam on the flat side of one cookie. Make a sandwich by pressing the flat side of a second cookie onto the jam. Sprinkle the sandwiches with confectioners’ sugar. 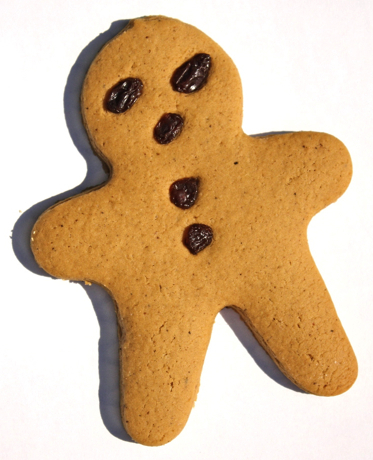 PAT’S BAKING TIPS: Buttery and tangy, these cookies are always popular on buffets or cookie trays during the holidays. Experiment on the easiest way to press out the cookies using the bowl of a teaspoon and forming the delicate oval shape. The dough is easy to shape because it’s slightly dry. Excerpted with permission from Scandinavian Classic Baking by Pat Sinclair, published in 2011 by Pelican Publishing Company of Gretna, LA; 504-368-1175, www.pelicanpub.com. Review copy provided by the publisher. 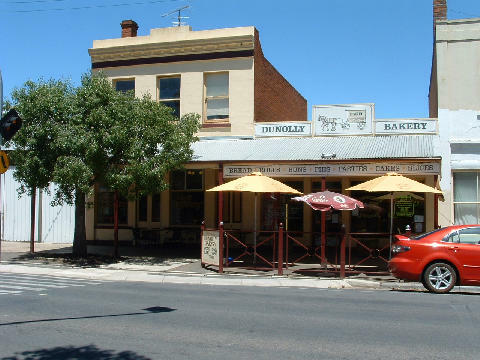 Click here to see the Bakery Boy Blog review of Pat Sinclair’s book. Click here for a separate Bakery Boy Blog post with a recipe for Scandinavian Apricot Almond Bars from Pat Sinclair’s Scandinavian Classic Baking. 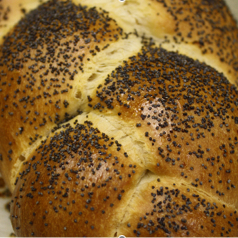 For more resources and inspiration, see www.onlinecookingschools.net. 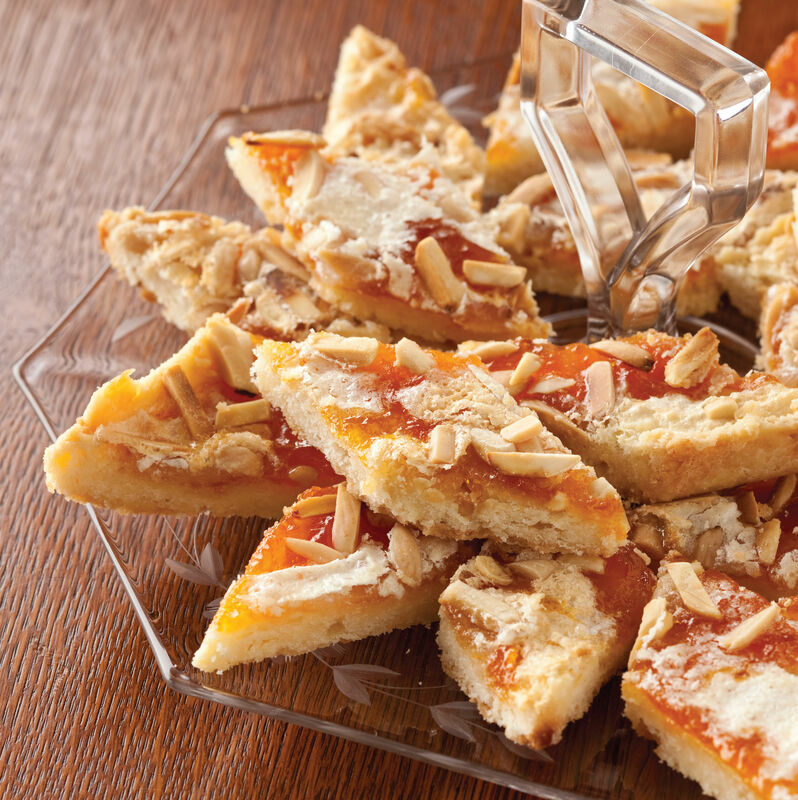 Pat Sinclair’s Scandinavian Classic Baking (from Pelican Publishing Company) includes this excellent recipe for Scandinavian Apricot Almond Bars. 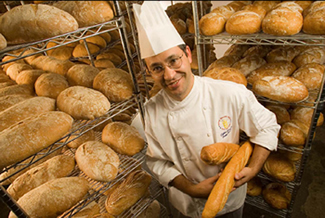 Click here to see a separate Bakery Boy Blog post with a review of Pat’s book. Scandinavian Apricot Almond Bars. 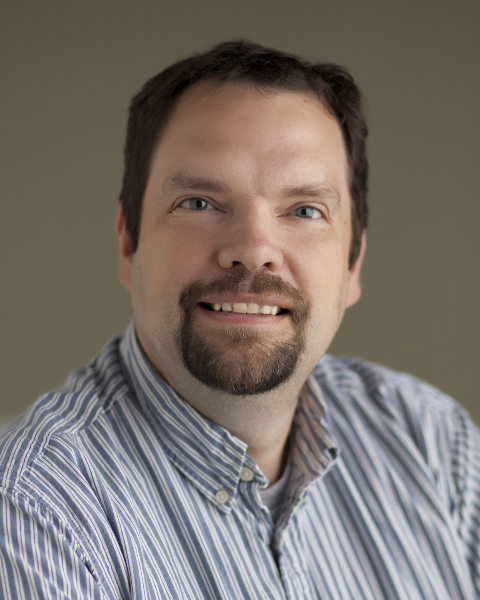 Photo by Joel Butkowski. Heat the oven to 350° F. Line the bottom of a 13” x 9” baking pan with aluminum foil, extending the foil over the long sides of the pan. Lightly spray the foil with nonstick cooking spray. Combine the flour, confectioners’ sugar and butter for the crust in a large bowl. Cut in the butter with a pastry blender until mixture resembles coarse crumbs. Press into the baking pan, pressing about ½” up the sides. Bake 15 to 20 minutes or until the edges begin to brown. While the crust is baking, toast the almonds. Place the almonds on a small baking dish and bake about 8 minutes. Beat the egg whites with a whisk until foamy. Beat in the confectioners’ sugar and almond extract. Spread the apricot preserves over the crust. Spoon the egg whites over the preserves without covering the preserved completely. Sprinkle with the almonds. Bake 15 to 18 minutes or until the topping is a golden brown. Run a metal spatula along the short sides of the pan to loosen the pastry. Cool completely on a wire cooling rack. Using the foil, lift the pastry from the pan and cut into 24 bars. To cut diamonds, cut lengthwise into 6 strips. Make parallel diagonal cuts on each strip to form diamonds. PAT’S BAKING TIPS: A pastry blender makes it easy to combine flour and butter for the crust and results in flaky layers. You can also use two knives and a scissor-like motion to get the same results. Don’t leave large pieces of butter, or holes will form when they melt. 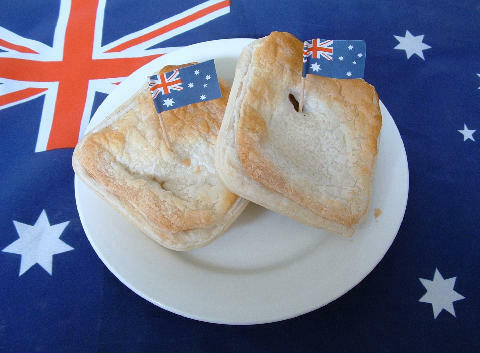 Click here to see a Bakery Boy Blog review of Pat Sinclair’s book. Click here for a separate Bakery Boy Blog post with a recipe for Finnish Browned Butter Teaspoon Cookies from Pat Sinclair’s Scandinavian Classic Baking. With “world’s best” in the name, does it live up to the claim? 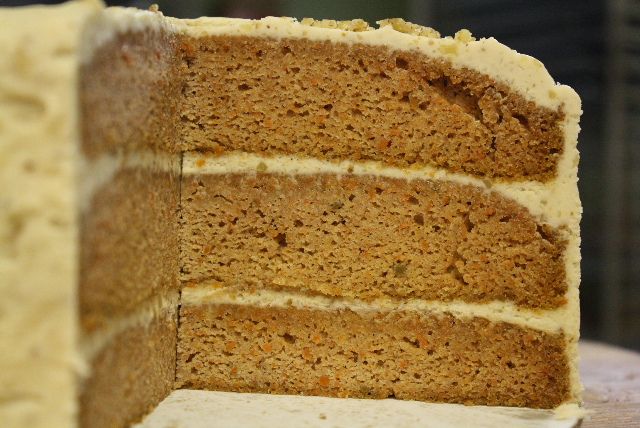 The World's Best Carrot Cake company stacks its signature treats mighty high. 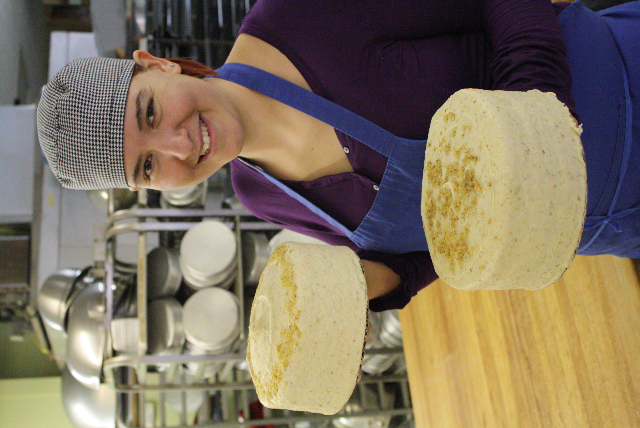 Production manager Hannah Layosa, whose parents founded World's Best Carrot Cake, makes hundreds of the rich, moist, tasty, organic-carrots-filled cakes each week. The larger cakes weigh in at five pounds apiece. 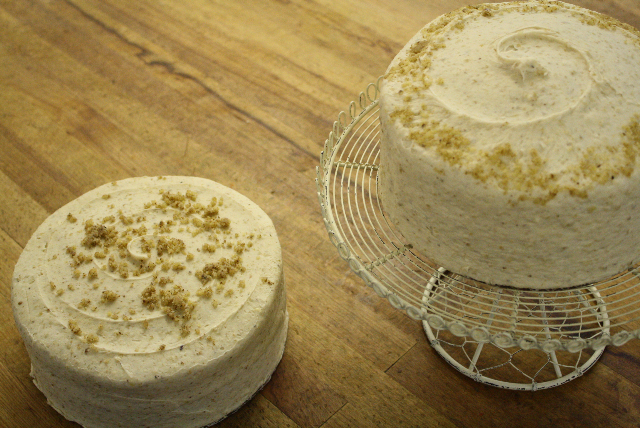 Each 8-inch-round, 3-layer cake weighs 5 pounds. 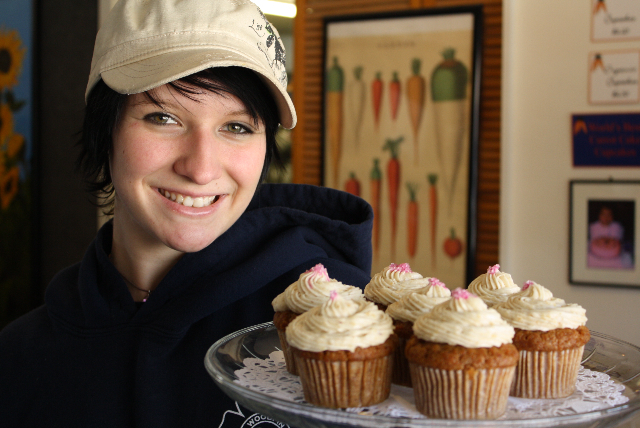 There are 6-inch, 4-inch, and cupcake versions too, all made from scratch, daily, in small batches, by hand. • ORGANIC CARROT CAKE The bakery’s original and still bestselling online cake has rich vanilla cream cheese and walnut icing between layers and covering the top and sides. It’s garnished with crushed walnuts ($49.99 plus shipping). • GLUTEN FREE CARROT CAKE Carefully processed brown rice flour from a gluten-free mill forms the basis of this version produced for gluten-free purists. Again the use of fresh, organic carrots and the same vanilla cream cheese-walnut icing as in the original keeps both moisture content and taste factors high. Garnished with a few walnut halves ($35 plus shipping). • CHOCOLATE GLUTEN FREE CARROT CAKE This one contains no wheat—for gluten-free fans—but plenty of carrots plus melted chocolate in the batter as well as in the velvety cream cheese icing. 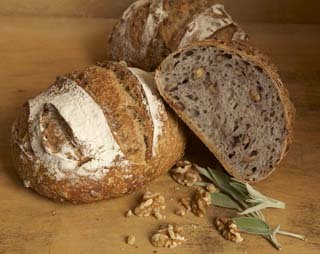 It’s garnished with an equal mix of chocolate chips and crushed walnuts ($38 plus shipping). • ORANGE CITRUS VEGAN CARROT CAKE This version is entirely dairy-free (no eggs, butter, milk, or cream cheese), features natural orange oil, and is garnished with hand-grated orange zest ($38 plus shipping). 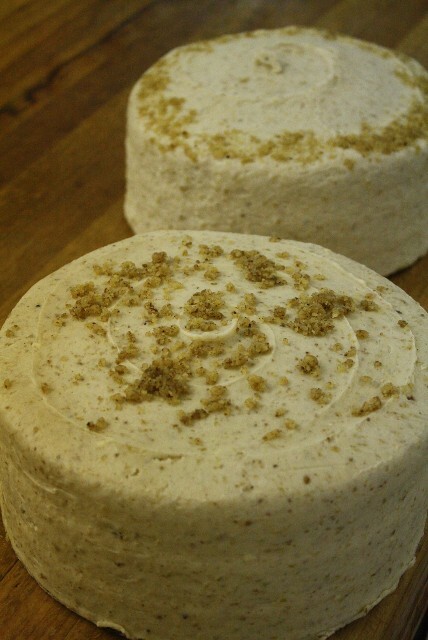 For more about these and other products visit www.worldsbestcarrotcake.com. 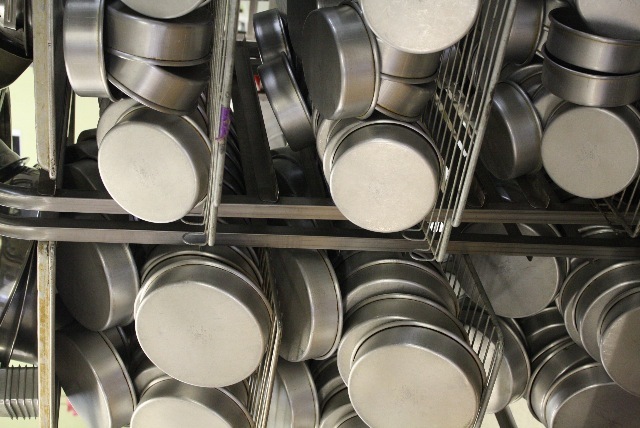 It takes a lot of cake pans to make as many carrot cakes as get made regularly at World's Best Carrot Cake. Anyone can walk in and buy a carrot cake from the small retail counter at the front of the World’s Best Carrot Cake production facility in Woodfin just north of Asheville. 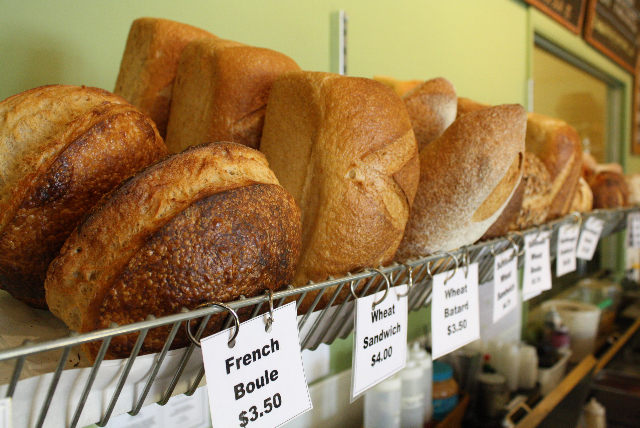 Or find a slice at local health-oriented eateries such as The Green Sage Coffeehouse & Café downtown. Or mail order home-delivered cakes via phone or web site. 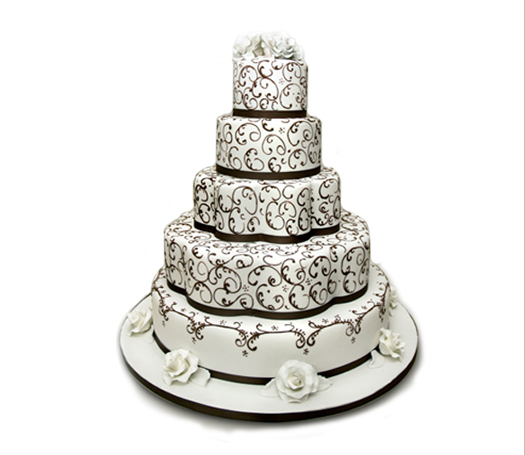 But by far most of the hundreds of cakes produced each week supply two key wholesale accounts that distribute them all across North Carolina and neighboring states. 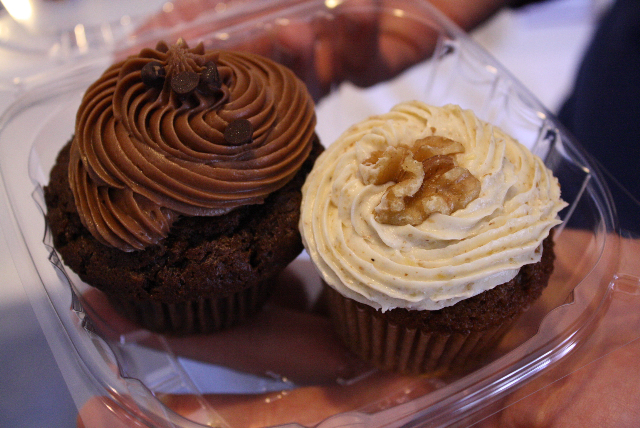 Cupcake versions of the Chocolate Gluten Free Carrot Cake (left) and the original Organic Carrot Cake. Employee Heather Taylor, affectionately dubbed the Icing Master, also handles retails sales. So are these indeed the world’s best carrot cakes? 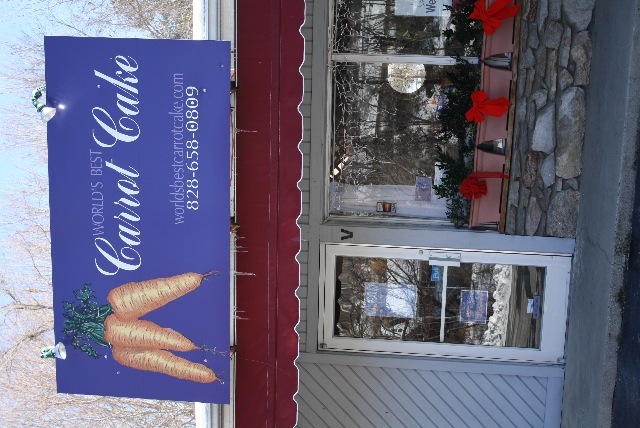 I’ll say this: I thoroughly enjoyed the ones I sampled at the World’s Best Carrot Cake headquarters. They were, as advertised, perfectly moist, plenty tasty, stacked high, and beautifully presented, both the whole cake and the cupcake versions. Because I haven’t personally tasted every carrot cake in the world for comparison (which sure would be a fine goal to pursue!) I can’t say with absolute certainty. Still, I firmly believe these desserts rank way up high in the hierarchy of carrot cakes. Here’s my suggestion: Order one or two and decide for yourself.